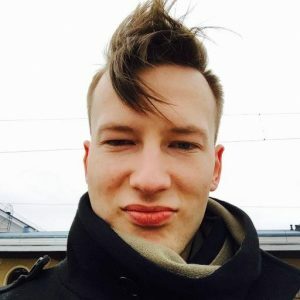 LanRan ransomware uses sophisticated techniques to infiltrate computers and hide from its victims. Use Reimage to determine whether your system is infected and prevent the loss of your files. LanRan ransomware - a sneaky virus which demands a 0.5 BTC ransom to receive a decryption key for blocked data. LanRan ransomware is a sneaky cryptovirus which seems to be a new version of the open-source MyLittleRansomware virus. On the affected machine, the virus changes the wallpaper and shows a lock screen. After infiltration, LanRan virus might modify Windows Registry. These alterations allow taking root into the system and activate malicious processes whenever the victim turns on the infected computer. However, the main purpose of the ransomware is to encrypt files immediately. It uses RSA-2048 encryption algorithm and aims at the most popular file types, such as MS Office documents, multimedia files, etc. A ransom note, named @___help___@ and urging 0.5 BTC for a file decryption key, appears. Recently a new version of this ransomware has been released – LanRan v2 which uses the .LanRan2.0.5 file extension to corrupt data. Thus, it takes over all personal files and important documents in order to convince more victims to pay the ransom. Although it’s easy to be threatened by the ransomware attack, the most important task is LanRan ransomware removal. Later you can think about the alternative ways to restore your files. Once LanRan ransomware virus completes data encryption procedure, it drops a ransom note. The crooks ask to transfer 0.5 Bitcoins to the provided Bitcoin wallet address in order to purchase LanRan Decryptor. This tool is vital for data recovery, and people need to contact creators of the ransomware via email lanran-decrypter@list.ru if they want to get back access to their files. Indeed, it might be hard to recover encrypted data if you do not have backups. The LanRan virus is likely to delete Shadow Volume Copies that are essential for the recovery. However, purchasing the decryption key from the hackers is not recommended either. They might gladly take your money and leave you without the decryptor. Cybercriminals are not the ones who can be trusted. Nevertheless, it’s not enough to remove LanRan from the computer to retrieve encoded data; this task is crucial. Only professional security tools, such as Reimage can clean your computer from this cyber threat. If you encounter some obstacles, please scroll down to the third part of the article. LanRan ransomware locks infected computer's screen and display an ugly ransom note where victims are informed about a necessity to pay the ransom. Malware researchers found few ransomware's samples lurking on the Web. The hackers might trick you into clicking on an infected link, ad or email attachment in order to install payload on your computer. Thus, if you receive a questionable link on social media, do not rush clicking it. Even if your friend sent it, he or she might not be aware of this activity. What is more, if you receive a strange email that expresses the urge to open the attached document, you need to make sure that it’s safe to open. System hijack might also occur if you decide to download infected or obfuscated freeware or other files from the unreliable sources. Hence, taking precautions and being vigilant is important in order to protect your data from ransomware. 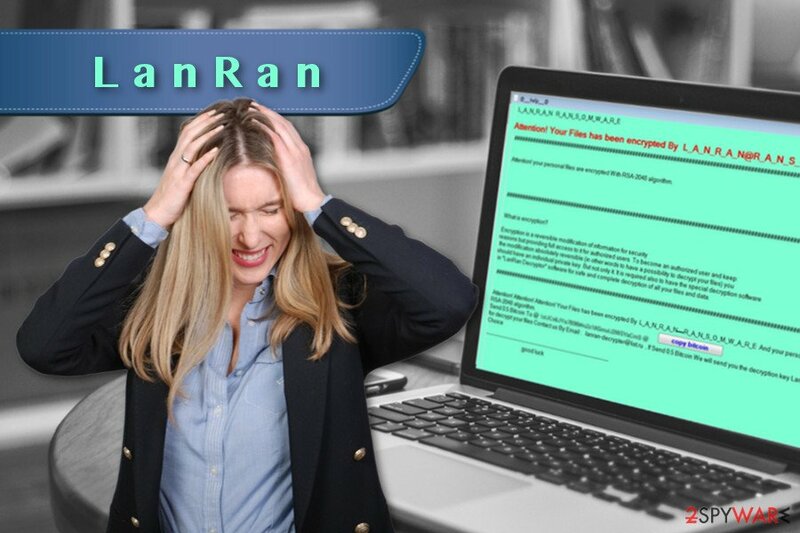 You can perform the LanRan virus removal by using professional malware elimination equipment. However, the virus might block antivirus programs or prevent from installing them. Thus, if you found yourself in this situation, please reboot your computer to the Safe Mode with Networking. The instructions below will help you to do that. When in Safe Mode, install and update your preferred malware removal program. If you have no idea which tool to choose, please pick either Reimage or Malwarebytes MalwarebytesCombo Cleaner. These programs are strong enough to remove LanRan ransomware along with all its malicious components from the system. Talking about possibilities to restore your files, we have to be honest and tell that if you do not have backups, chances are not high. Researchers haven’t developed a decryption software yet. However, you can try alternative recovery options presented below. In order to turn off the lock screen and disable the virus, you need to reboot your device to the Safe Mode with Networking. When in Safe Mode, install your preferred malware removal program and scan the system several times. Log in to your infected account and start the browser. Download Reimage or other legitimate anti-spyware program. Update it before a full system scan and remove malicious files that belong to your ransomware and complete LanRan removal. System Restore method also helps to get rid of the lock screen and install or activate security program necessary for the LanRan elimination. When a new window shows up, click Next and select your restore point that is prior the infiltration of LanRan. After doing that, click Next. Once you restore your system to a previous date, download and scan your computer with Reimage and make sure that LanRan removal is performed successfully. Guide which is presented above is supposed to help you remove LanRan from your computer. To recover your encrypted files, we recommend using a detailed guide prepared by 2-spyware.com security experts. Paying the ransom is not a safe and reliable way to rescue your files. Cybercriminals might not provide you decryption software or offer to use a malicious one. As a result, you will lose your money and might get infected with other malware. Thus, if you do not have backups, please try alternative recovery methods that might help to restore at least some of the files. However, LanRan deletion must be performed before. Originally, this tool was designed to restore damaged or deleted files. However, developers update it in order to help victims from the ransomware to rescue at least some of encoded files. Windows Previous Versions feature allows accessing previously saved versions of the encrypted files, but only if System Restore function has been enabled before the attack. Otherwise, copying individual files is not valid. Nevertheless, cybercriminals offer to purchase decryption software; we do not recommend doing it. If none of the above methods have worked for you, or you still need to recover lots of files, please be patient and wait for the official LanRan decrypter created by the virus researchers. ^ Tim Greene. Consultant urges never pay ransomware demands. ITWorld. IT news, careers, business technology, reviews. ^ Kacy Zurkus. Social media, the gateway for malware. CSO. Security news, features and analysis about prevention, protection and business innovation. ^ Jason Murdock. How to tell if an email is fake: 5 tips to avoid scams and identify phishing attempts. International Business Times. Business News, Technology, Politics. ^ Paul Rubens. Understanding Ransomware Vectors Key to Preventing Attack. eSecurity Planet. Internet security for IT pros. This entry was posted on 2017-04-04 at 07:18 and is filed under Ransomware, Viruses. You can quickly scan the QR code with your mobile device and have LanRan ransomware virus manual removal instructions right in your pocket. How did you remove LanRan virus?